The Initiative's Research Grants Program encourages collaboration to fight a disease that knows no borders. The Initiative has funded more than $827,000 in Ewing's sarcoma research grants. Dr. Rubin explains the need for mouse models of human sarcomas. Ewing's sarcoma tumors represent the second most common type of bone tumors in children and adolescents, with a peak incidence at 15 years old. In Europe, most patients are treated in the Euro-EWING99 clinical trial with 73% EFS for 3 years for localized tumors. As patients with metastatic tumors outside lungs or pleura or not responding to chemotherapy and have a poor survival rate (EFS and OS < 30%), there is an urgent need to develop adjuvant therapies to improve outcomes. 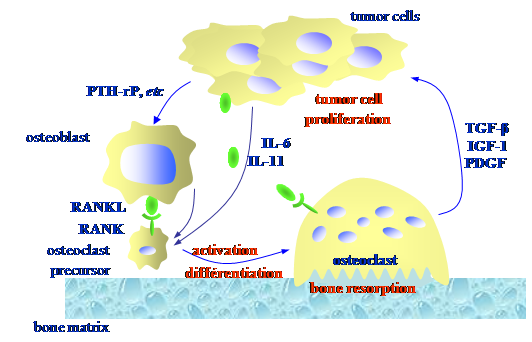 Tumor development in a bone site is associated with a vicious cycle between tumor cell proliferation and bone resorption: tumor cells secrete osteoclast activating factors [such as Receptor activator of NF-kappa B Ligand (RANKL)] which induce the differentiation and activation of osteoclasts, the only cells able to resorb bone. Osteoclast activity allows the release of growth factors stored in the bone matrix which in turn activate tumor cell proliferation. Therefore, targeting molecular or cellular protagonists involved in the bone resorption process represents an interesting therapeutic option for Ewing's sarcoma (EWS). Among inhibitors of bone resorption, Bisphosphonates (BPs) are promising candidates because they have been used with success for many years to treat complications associated with bone metastases, as demonstrated in several randomized clinical trials, in particular for prostate and breast cancers.1 Beyond their osteoclastic activity, clinical and pre-clinical studies suggest that these molecules also exert a direct antitumor activity, inducing apoptosis in several tumor cell lines including primary bone tumors such as osteosarcoma or chondrosarcoma. Preclinical data obtained in our lab demonstrated that the combination of chemotherapy with zoledronate (N-containing BP) clearly have synergistic effects on inhibition of tumor development, of osteolytic lesions and on the augmentation of animal survival in two animal models of osteosarcoma.2,3 From these results, the French OS2006 protocol has been established associating zometa® with conventional therapy in children and adults. 1. At the primary tumor level: The objectives were to study the potential therapeutic effects of zoledronate (ZOL) alone or combined with chemotherapy in Ewing's sarcoma using complementary in vitro analyses (mechanisms of action: proliferation, apoptosis, cell cycle, resistance, invasion..) and preclinical approaches. Bone and soft tissue models of Ewing's sarcoma were induced by injection of human tumor cells respectively in the tibia medullar cavity or in intra-muscular site in immune-deficient mice. Zoledronate was delivered subcutaneously at the dose of 50-100 microgr/kg, twice/week during 4-5 weeks (corresponding to clinical relevant pediatric dosing regimen in oncology) associated with ifosfamide (15 mg/kg as 1 to 3 courses). Several parameters were analyzed during the treatments by radiography, microCT (bone micro-architecture), histology, and biology (bone remodeling parameters in the serum). The mechanisms of sensitivity/resistance were also studied, thanks to the 10 human Ewing's sarcoma cell lines available. 2. Second, the effect of zoledronic acid was also studied on the invasion and metastasis ability of Ewing's sarcoma cells respectively in vitro and in vivo. The relevance of testing the therapeutic potential of zoledronic acid in Ewing's sarcoma is based on the existence of complex interactions between tumor cells and bone cells in the bone tumor microenvironment (Figure 1) . As described for osteosarcoma4, high amount of RANKL is present in the tumor microenvironment, leading to osteoclast activation. This activation can be direct (direct production of RANKL by tumor cells) or indirect through osteoblasts via the production of soluble factors (cytokines, growth factors) that further activate osteoclasts. When they are activated, mature osteoclasts degrade the bone matrix and allow the release of growth factors stored in the bone matrix, such as Transforming Growth Factor-b (TGF-b), Insulin-like Growth Factor (IGF) and Platelet Derived Growth Fractor (PDGF) that in turn activate tumor cell proliferation. So we decided to analyse the effect of zoledronic acid (ZOL), a bisphosphonate of the third generation, which not only strongly inhibits osteoclast activity, but also influences Ewing's sarcoma cell proliferation in vitro. Preliminary results from the lab evidenced in vivo the major influence of the bone microenvironment on a ZOL-induced inhibitory effect on primary bone tumor development. Indeed, ZOL strongly inhibits tumor progression in the bone in a model induced by intra-tibia injection of Ewing's sarcoma cells (the mice were treated 8 weeks with 100 µg/kg ZOL, twice a week), whereas no effect was observed in a model induced in soft tissue.5 The hypothesis is that ZOL is highly concentrated in the bone matrix and is at higher concentration for adjacent tumor cells in bone than when tumors are induced in soft tissue, where ZOL cannot diffuse and concentrate. A grant from the Liddy Shriver Sarcoma Initiative allowed us to complete this work by studying in depth several aspects of ZOL inhibitory effects on Ewing's sarcoma progression, by complementary in vitro and in vivo approaches. The major aim of this study was to establish proof-of-concept of the beneficial therapeutic effect of ZOL in Ewing's sarcoma before its transfer to the clinics. 1. Effect of zoledronic acid (ZOL) on primary tumor development. In light of previous promising results observed in bone sites, we wanted to study the effect of ZOL on early Ewing's sarcoma development in bone. Mice were treated or not with 50 or 100 µg/kg ZOL twice or 3 times a week, as early as 1 day after human Ewing's sarcoma A-673 cell injection (106 in the medullar cavity of tibia) up to 18 days. These doses correspond respectively to the paediatric (50 µg/kg, 3x/week) or adult (100 µg/kg, 2x/week) dosing regimen proposed to patients. At euthanasia, tumor bearing legs and lungs were analyzed by histology. A schedule was developed (Figure 2). The invasion of bone tissue by Ewing's sarcoma cells was analysed on tumor + bone tissue slices by Masson's trichrome staining. 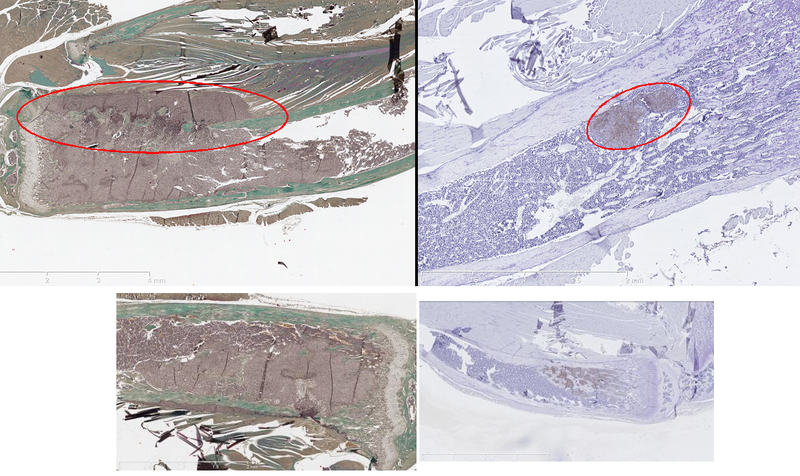 No differences could be seen on intra-tibia progression up to day 10 after tumor cell injection (Figure 3A: CT and B: ZOL-treated mice). At day 13-18 after tumor cell injection, the cortical bone was destroyed by Ewing's sarcoma cells in control untreated mice, whereas it was preserved in ZOL-treated animals. The consequence was an early invasion of adjacent soft tissues by tumor cells in control mice (CT, figure 4A). On the contrary, the tumor remains contained in the medullar cavity in ZOL-treated mice and tumor cells did not invade surrounding soft tissues (figure 4B: ZOL treated mice). However, very few Ewing's sarcoma cells could be seen in the cortical bone of ZOL-treated mice at the end of the experiment (day 35-42, figure 4D). Whereas in control mice, cortical bone destruction was often evidenced as soon as day10 after tumor cell injection (figure 4C). In conclusion, in untreated mice, we could observe the early presence of tumor cells in the cortical bone (day 7-10) and the very rapid development of tumor volume due to invasion of surrounding soft tissues after cortical bone destruction. In ZOL treated mice, a tumor development can be observed inside the bone in some cases and Ewing's sarcoma cells could be found in the cortical bone. However, the cortical bone was not degraded (as compared to tibias of untreated mice) and the only way for Ewing's sarcoma cells to invade surrounding soft tissues (seen in rare cases) was through the invasion and destruction of metaphysic bone. On the way out, the bone is slowed down and we can compare this process to a containment mechanism. In addition, the presence of TRAP positive cells (in red) was compared in both cases, but no differences could be seen at the growth plate level (Figure 5A: CT and B: ZOL). 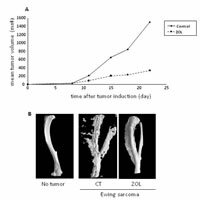 Direct or indirect ZOL effect in vivo: comparison between models induced by sensitive or resistant Ewing's sarcoma cell lines. To study this critical aspect in more detail, the effect of ZOL was compared in two models of Ewing's sarcoma: one induced by sensitive cells (A673) and the other by resistant cells (TC-71). Results showed that ZOL significantly inhibits Ewing's sarcoma mean tumor development in sensitive model (Figure 6A: A673 cells), whereas it has no effect in a model induced by the injection of a resistant cell line (Figure 6B: TC-71 cells). The in vivo experiments confirmed the direct effect of ZOL on Ewing's sarcoma cells observed in vitro. We also compared the effect of different protocols (doses, number and frequency of injections) to see whether we could improve the therapeutic effect of ZOL. Unfortunately, no significant difference could be seen. Therefore, we continued with both dosing regimens: 50 µg/kg, 3 times/wk (human paediatric protocol) or 100 µg/kg, 2x/week (adult protocol). The first step concerned the screening of all Ewing's sarcoma cell lines available in the laboratory for their sensitivity to zoledronic acid. 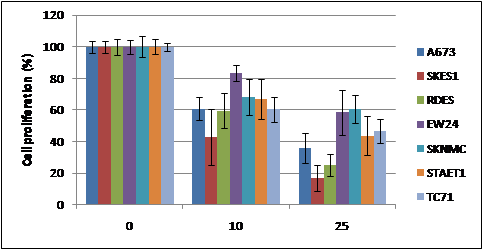 The results showed dose-dependent effects of ZOL on the seven human EWS cell lines studies, but some cell lines were more sensitive than the others (Figure 7). ZOL inhibits EWS cell proliferation by inducing caspase-dependent apoptosis and blocks the cell cycle in S-G2M phase. The seven human EWs cell lines differ in p53 status, but no correlation could be establish between p53 status and ZOL sensitivity. Another aspect that we were interested in was the mechanisms of ZOL "resistance" in Ewing's sarcoma. Previous studies from our laboratory evidenced that in osteosarcoma, ZOL resistance was associated with the level of one of the proteases involved in the mevalonate pathway: the farnesyl diphosphate (FPP) synthase.6 So we analyzed by RT-qPCR the level of FPP expression in the seven EWS cell lines studied. Unfortunately, no correlation could be evidenced, suggesting that the mechanisms of ZOL resistance are different between osteosarcoma and Ewing's sarcoma. Another issue that has never been studied is the effect of ZOL on Ewing's sarcoma cell invasion, migration and metastasis ability. Ewing's sarcoma cells were cultured in Boyden chambers covered with Matrigel. This type of experiment provides the first information about invasion ability of tumor cells. The results clearly demonstrated that ZOL-treated EWS cells lose their ability to invade the Matrigel, the same number of tumor cells being deposited on the upper part of the chamber (figure 8 A and B). The mean number of tumor cells that invade the Matrigel drop down from 130/field for the control untreated cells to 24/field for the ZOL treated cells. Next we wanted to determine the mechanism involved in the ZOL-induced inhibition of cell invasion. For this purpose, the activity of two major proteinases involved in cell migration and invasion (MMP-2 and MMP-9) was analyzed by the zymography technics. Supernatants of EWS cells treated or not with ZOL were analyzed by gel electrophoresis containing gelatine (denatured collagen) as a substrate. The results showed a decrease mainly of MMP-2 activity in ZOL-treated A673 cells, but also a slight inhibition for MMP-9 (Figure 9). Complementary analyses were performed in vivo in mice injected (intra-osseous) with EWS cells and treated or not with ZOL (50 µg/kg, 3x/week). Lung metastases were analysed at autopsy macroscopically and by histology (CD99 staining). Lung metastases were numerous, small and big in the control untreated group (figure 10A), whereas few metastases (but always big) were observed in ZOL treated mice (figure 10B). In fact, it appears that "big" metastases reflect the initial injection of tumor cells in the bloodstream (at the time of intra-tibia injection), corresponding to "experimental" metastases. Therefore, the fact that very few or even no small metastases are detected in the ZOL-treated group suggests that ZOL inhibits the dissemination of spontaneous metastases from primitive bone tumors. This is the first time that an inhibitory effect of Zoledronic acid was evidenced on metastasis formation whatever the site of metastasis. This study's results on the effects of ZOL on Ewing's sarcoma cell invasion and metastasis dissemination have been submitted for publication in BMC Cancer. These results strongly suggest that zoledronic acid is a very promising therapeutic option for primary bone Ewing's sarcoma tumors, and it also inhibits lung metastasis dissemination, one of the negative prognosis factors for Ewing's sarcoma patients. These results have been presented to clinicians, and the addition of zoledronic acid to conventional chemotherapy is proposed for the next EuroEWING protocol that will begin in France, Great Britain, Italy and potentially other European countries in 2013. The full title of this experimental plan for citation is, "Targeting Bone Microenvironment as a New Therapeutic Strategy in Ewing's Sarcoma: Combination of Zoledronic Acid with Chemotherapy in Mouse Preclinical Models." 1. Heymann D, Ory B, Gouin F, Green JR, Rédini F. (2004) Bisphosphonates: new therapeutic agents for the treatment of bone tumors. Trends Mol Med. 10(7):337-43. 2. Heymann D, Ory B, Blanchard F, Heymann MF, Coipeau P, Charrier C, Couillaud S, Thiery JP, Gouin F, Rédini F. (2005) Enhanced tumor regression and tissue repair when zoledronic acid is combined with ifosfamide in rat osteosarcoma. Bone. 37(1):74-86. 3. Ory B, Heymann MF, Kamijo A, Gouin F, Heymann D, Rédini F. (2005) Zoledronic acid suppresses lung metastases and prolongs overall survival of osteosarcoma-bearing mice. Cancer. 104(11):2522-9. 4. Lamoureux F, Richard P, Wittrant Y, Battaglia S, Pilet P, Trichet V, Blanchard F, Gouin F, Pitard B, Heymann D, Rédini F. (2007) Therapeutic relevance of osteoprotegerin gene therapy in osteosarcoma: blockade of the vicious cycle between tumor cell proliferation and bone resorption. Cancer Res. 67(15):7308-18. 5. Odri GA, Dumoucel S, Picarda G, Battaglia S, Lamoureux F, Corradini N, Rousseau J, Tirode F, Laud K, Delattre O, Gouin F, Heymann D, Rédini F. (2010) Zoledronic acid as a new adjuvant therapeutic strategy for Ewing's sarcoma patients. Cancer Res. 70(19):7610-9. 6. Ory B, Moriceau G, Trichet V, Blanchard F, Berreur M, Rédini F, Rogers M, Heymann D. (2008) Farnesyl diphosphate synthase is involved in the resistance to zoledronic acid of osteosarcoma cells. J Cell Mol Med. 12(3):928-41. Ewing's sarcoma represents the second cause of malignant bone tumors in children and adolescents. In Europe, most patients are treated in the Euro-EWING99 clinical trial with 73% event free survival (EFS) at three years for localized tumors. Survival rates are poor, however, for patients with metastases outside the lungs or pleura and patients not responding to chemotherapy (EFS and overall survival < 30%). Tumor development in bones is associated with the existence of a vicious cycle between tumor cell proliferation and bone resorption. Therefore, targeting the bone resorption process represents an interesting therapeutic option for these tumors. The present project aims at combining zoledronic acid, a potent inhibitor of bone resorption, with chemotherapy in preclinical models of Ewing's sarcoma. The impact of these studies will be to propose zoledronic acid as adjuvant therapy for Ewing's sarcoma patients in the next European protocol to help prevent recurrence and metastasis and to improve prognosis for patients with metastatic or unresponsive disease. 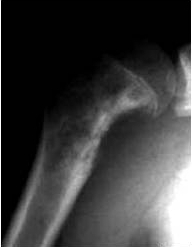 Ewing's sarcoma was first described in 1921.1 It is the second most frequent primary bone tumor before 20 years of age, occurring mostly in the second decade of life, with a frequency of 1 per million per year.2 The disease is characterized by a rapid tumor growth and extensive bone destruction with periostal reaction (Figure 1). Ewing's sarcoma features a specific chromosomal translocation between the EWS gene on chromosome 22 and a gene of the erythroblast transformation sequence (ETS) family. This translocation leads to the production of the oncogenic fusion gene EWS-FLI1 (t(11;22)(q24;q12)) in 85% of cases but also to EWS-ERG (t(21;12)(q22;q12)) in 10% of cases and EWS-ETV1,4 or -FEV in the remaining 5% of cases.3-5 The protein encoded by this fusion gene is an aberrant transcription factor that promotes tumorogenicity in mesenchymal stem cells.6 Other tumors have been found to have the same translocations and are now part of the Ewing's sarcoma family of tumors. The presence of this fusion gene is used as a specific diagnostic marker of the Ewing's tumor family thanks to fluorescence in-situ hybridization and RT-PCR. All of these translocations involve the fusion of the Ewing's sarcoma (EWS) gene with an erythroblast transformation sequence (ETS) family gene. The EWS gene encodes protein of uncertain function, while the ETS family is composed of transcription factors. Accordingly, the major resultant EWS-FLI fusion protein is placed under control of the Ewing's sarcoma promoter. Previously, specific features of the translocation were thought to impact survival. However, with current modern treatment protocols, survival rates of patients with the different translocations appear to be the same. Before chemotherapy was introduced, Ewing’s sarcoma patients survival was poor, ranging from 3 to 15% at five years.7,8 Because Ewing’s sarcoma is very sensitive to radiation therapy, it was the preferred treatment in the early years of understanding the disease. However, this led to a poor five-year survival, and surgery was considered the best option when possible. Surgery consisted of primary amputation or radical excision, which led to 20% survival rates. Nevertheless, most of the patients died of metastases which were present at diagnosis (25%) or appeared after the treatment. It became evident that a systemic therapy was needed. Since 1999, the still accruing EURO-EWING group (which involves the SFCE, GCF, SIAK, EORTC, and EICESS European groups and the American COG group) tested the clinical benefits of a different chemotherapy combination involving Vincristine, Ifosfamide, Doxorubicin and Etoposide (VIDE). The protocol is composed of 6 sequences of VIDE treatment followed by surgery when possible. The histological response to chemotherapy is then evaluated and patients are divided into 3 arms according to the tumor localization at diagnosis, the volume for unresected tumors and the percentage of residual cells after treatment (Figure 2). The R1 arm includes patients with localized disease with good response to chemotherapy (<10% of residual cells) or with tumor volume below 200ml. The R2 arm involves patients with lung metastases and patients with localized tumor with poor response to chemotherapy or with a tumor volume above 200ml. Finally, the last arm (R3) includes patients with bone, bone marrow or multifocal metastases. 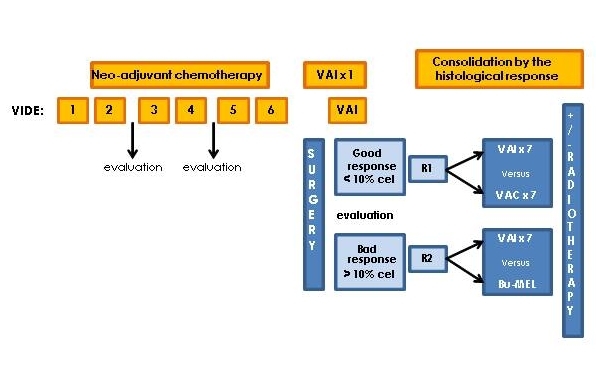 For the R1 group, adjuvant chemotherapy is randomized between 7 sequences of a combination of Vincristine and actinomycine with cyclophosphamide (VAC) or ifosfamide (VAI). For the R2 group, adjuvant therapy is randomized between VAI and a stronger chemotherapy composed of busulfan and melphalan. For the R3 group giving the lower survival prognosis, treatment options consist in high dose of melphalan-melphalan, busulfan/melphalan with autologous stem-cell transplantation or, in the worst cases, a Phase II clinical trial. The current survival rate for EURO-EWING patients reaches 80% for localized disease of small volume (R1 arm). Unfortunately, five-year survival for patients with metastases detected at diagnosis remains around 25%, and even around 7% when relapse occurs in the first two years after treatment. Accordingly, new therapeutic options should be tested, and the inhibition of tumor-associated bone resorption seems to be a promising axis showing encouraging preclinical results in bone tumor pathology. Skeletal complications remain the major issue of primary bone tumors. In osteosarcoma and Ewing's sarcoma, as well as in bone metastasis secondary to breast, lung or prostate carcinoma, skeletal lesions lead to bone pain and pathological fractures. Skeletal integrity is controlled by a balance between bone formation and bone resorption, under the control of osteoblasts and osteoclasts, respectively. This equilibrium is altered by tumor cells leading to osteolytic and/or osteoblastic lesions. Moreover, the interaction between tumor cells, tumor-derived humoral factors and bone marrow microenvironment has shown to be essential for bone tumor initiation and promotion. Osteoblasts are specialized cells that are responsible for bone formation. They are derived from mesenchymal stem cells in the bone marrow. Bone degradation, also called bone resorption, is under the control of a lonely cell type: the osteoclast. These large cells with up to 20 nuclei are derived from another type of stem cell present in bone marrow: the hematopoietic stem cell. The adult skeleton is completely renewed every 10 years thanks to the fine regulation of osteoblast and osteoclast functions, called bone remodeling. As evidenced in bone metastases, a vicious cycle occurs during bone tumor development between bone resorption and tumor proliferation.16, 17 The tropism of primary and metastatic tumor cells for bone is linked to the presence of growth factors, such as Insulin-like Growth Factor-1 (IGF-1), Transforming Growth Factor-β (TGF-β) or Fibroblast Growth Factor (FGF), in the bone microenvironment itself after their release from the bone matrix during bone resorption.18-20 All those factors stimulate tumor engraftment and proliferation according to the "seed and soil" hypothesis.21 In turn, tumor cells produce pro-osteolytic factors (such as hormones, cytokines and growth factors) directly or indirectly through stromal cell interaction.22-24 Among these factors, parathyroid hormone related peptide (PTH-rP) promotes osteoclast differentiation, activation and survival through Receptor Activator of NF-Kappa B Ligand (RANKL) production by osteoblasts, leading to final bone resorption. 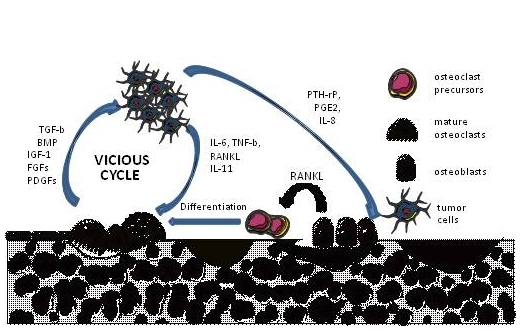 Therefore, the increased bone resorption favours the vicious cycle by inducing the release of growth factors stored in the bone matrix and further enhances tumor proliferation (Figure 3). Increased calcium concentration in the bone microenvironment induced by bone destruction has also been shown to increase tumor growth and PTH-rP production. Among the new investigational approaches to improve therapy in Ewing's sarcoma, bone-specific agents may improve survival and/or quality of life on "continuation" therapy. This would include regimens with fewer short- and long-term side effects and better results for tumors in difficult locations and patients with recurrent disease. The story of bisphosphonates starts back in the 1930’s, when it was discovered that polyphosphates were capable of acting as water softeners by inhibiting the crystallization of calcium salts, such as calcium carbonate. Attempts to exploit these concepts by using pyrophosphate and polyphosphates to inhibit ectopic calcification in blood vessels, skin, and kidneys in laboratory animals were successful only when the compounds were injected. The bisphosphonates (at that time called diphosphonates), characterized by P-C-P motifs, were among the molecules developed in the 1960’s that could be administered orally and have the same anti-mineralisation properties. The most important finding was that bisphosphonates had the novel property to inhibit the dissolution of hydroxyapatite crystals. It was then shown that they could also inhibit bone resorption like immobilization osteoporosis or after ovariectomy, and this led to their use in preventing osteoporosis. The bisphosphonates developed later were more potent inhibitors of bone resorption and less potent inhibitors of skeletal mineralization. For several years nitrogen-containing BPs (N-BPs) have been used with success to treat complications associated with bone metastases, as demonstrated in several randomized clinical trials, in particular trials for prostate and breast cancers. Beyond their osteoclastic activity, clinical and pre-clinical studies suggest that these molecules also exert a direct anti-tumor effect, inducing apoptosis in several tumor cell lines.30 This effect is reinforced by the association with chemotherapeutic agents such as paclitaxel, gemcitabine, doxorubicin or epirubicin. Among all the bisphosphonates tested, zoledronic acid (ZOL), one of the third generation nitrogen-containing BPs, shows the greatest inhibitory effects on both osteoclast activity and tumor cell proliferation.31 Quite appropriately, these agents are increasingly used alongside anticancer treatments to prevent skeletal complications and relieve bone pain. There are two modes of action of bisphosphonates, characterizing two groups: the non-nitrogen containing bisphosphonates and the nitrogen containing group. The first group most closely resembles pyrophosphate, such as etidronate and clodronate, and can be metabolically incorporated into nonhydrolyzable analogues of adenosine triphosphate (ATP) by reversing the reactions of aminoacyl–transfer RNA synthetases. It is likely that intracellular accumulation of these metabolites within osteoclasts inhibits their function and may cause osteoclast cell death. The second group contains the more potent bisphosphonates such as alendronate, risedronate, and zoledronate. Members of this group interfere with other metabolic reactions, notably in the mevalonate biosynthetic pathway, and affect cellular activity and cell survival by interfering with protein prenylation and, therefore, the signaling functions of key regulatory proteins. The mevalonate pathway is a biosynthetic route responsible for the production of cholesterol, other sterols, and isoprenoid lipids such as isopentenyl diphosphate (also known as isopentenyl pyrophosphate), as well as farnesyl diphosphate (FPP) and geranylgeranyl diphosphate (GGPP). FPP and GGPP are required for the posttranslational modification (prenylation) of small GTPases such as Ras, Rab, Rho, and Rac, which are prenylated at a cysteine residue in characteristic C-terminal motifs. Small GTPases are signaling proteins that regulate a variety of cell processes important for osteoclast function, including cell morphology, cytoskeletal arrangement, membrane ruffling, trafficking of vesicles, and apoptosis. The first preclinical study reporting the therapeutic benefit of using ZOL to treat Ewing's sarcoma showed an inhibitory effect on osteolysis, but no data on survival and tumor volume were given.43 We then performed in vitro experiments to evaluate the effect of ZOL on eight human Ewing's sarcoma cell lines, all expressing the EWS-FLI1 fusion gene but differing in their molecular characteristics by their p53 mutation status and p16/ink4 deletion. Then, in vivo experiments were performed to study the effects of ZOL on tumor progression and animal survival, as a single therapeutic agent or in combination with ifosfamide, a conventional drug used in Ewing's sarcoma clinical protocols. Two different animal models of Ewing's sarcoma were developed reproducing both clinical behaviors of Ewing's sarcoma: soft tissue and bone development (respectively 15% and 85% of total Ewing's sarcomas) (Figure 5A and B, respectively). From these preliminary experiments, several promising results were obtained. Briefly, mice were treated with ZOL and/or ifosfamide, both at doses corresponding to clinical ones administrated in patients. Ewing's sarcoma cell lines showed different sensitivity to ZOL and mafosfamide, but no correlation with their molecular status was evidenced. 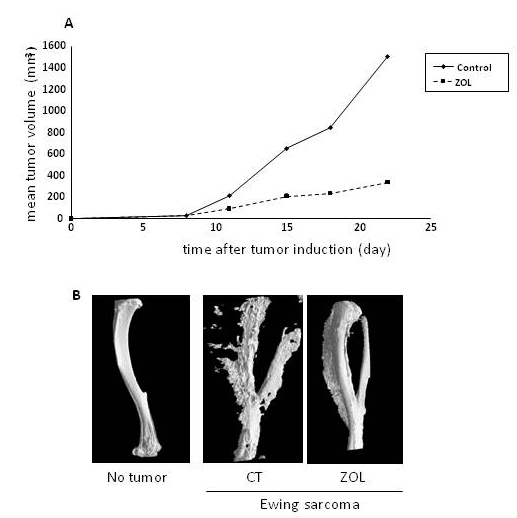 In our experimental model of Ewing's sarcoma, ZOL had no effect on soft tissue tumor progression, although it dramatically inhibited Ewing's sarcoma development in bone (Figure 6A). ZOL also prevented the development of bone lesions associated with tumor progression (Figure 6B). When combined with chemotherapy, ZOL exerted synergistic effects in the model developed in soft tissue: its combination with one cycle of ifosfamide resulted in an inhibitory effect on tumor development similar to three cycles of ifosfamide alone. These data have been accepted for publication in Cancer Research. These promising results prompted us to propose a broader scientific program to study the benefits of using ZOL as adjuvant therapy in Ewing's sarcoma tumors and metastases and to study the molecular mechanisms involved in ZOL resistance, which is the purpose of the present project. The objectives of this program are to study the potential therapeutic effects of zoledronate (ZOL) alone or combined with chemotherapy in Ewing's sarcoma using complementary in vitro analyses (mechanisms of action: proliferation, apoptosis, cell cycle, resistance) and preclinical approaches (bone and soft tissue models of primary Ewing's sarcoma induced by injection of human tumor cells respectively in the tibia medullar cavity or in an intra-muscular site in immune-deficient mice). The effects of this therapeutic combination will also be studied in models of bone or pulmonary metastases induced by injection of Ewing's sarcoma cells via intraveinous or intracardiac routes, respectively. Indeed, the patients with high risk of relapse are those who present with metastases at diagnosis or whose tumors are resistant to chemotherapy. Initial resistant human Ewing’s sarcoma cell lines (EW-24, TC-32, TC-71, SK-N-MC,) will be analysed by proliferation assay to confirm their resistance (cell viability tests) to zoledronate (1-100 µM, 24 to 72 hours). Gene expression profiles will be compared between one sensitive (A673) and one resistant (TC-71) cell line, thanks to collaborative study with Drs O. Delattre and F. Tirode (INSERM U830, Institut Curie, Paris, France). In serum or plasma of patients: the level of bone markers will be analysed by ELISA [osteocalcin, Bone SialoProtein, Bone Alkaline Phosphatase, Tartrate Resistant Acid Phosphatase 5b, Collagen degradation products (CTX)] and cytokines involved in the regulation of bone remodelling (cytokines of the TNF family: OPG, RANK, RANKL, TRAIL; cytokines of the IL-6 family: IL-6, OSM, LIF...). In biopsies of patients: predictive factors of N-BP sensitivity (FPPsynthase and other genes determined by microarray analysis) will be analyzed. Using resistant human Ewing's sarcoma cell lines (mainly TC-71, but also EW-24 or TC-32 or SK-N-MC) injected into the medullar cavity of the tibia in order to study the direct and indirect anti-tumor effect of ZOL through bone resorption inhibition. Models of pulmonary or bone metastases induced respectively by intraveinous or intracardiac injection of luciferase-expressing EWS cells. The effect of ZOL will be tested in these models, alone or combined with chemotherapy (ifosfamide: 15 mg/kg 3 consecutive days/wk, during 3 wks). Several parameters will be studied in these animals, at the clinical (tumor volume, weight), radiography, micro-architecture (micro-scanner analysis), biological (bone remodelling parameters), histology (Masson’s trichrome, von Kossa, TRAP staining), and histomorphology levels. Details of the protocols: Zoledronate will be delivered subcutaneously at the dose of 100 microgr/kg, twice a week for 4-5 weeks (corresponding to clinical relevant dosing regimen in adult oncology) or at the dose of 50 microgr/kg every two days, 10 times (corresponding to pediatric protocols), associated with ifosfamide (15 mg/kg as 1 to 3 courses) or doxorubicin (2 mg/kg, weekly). This project will allow us to determine a molecular signature predictive of the resistance of human Ewing's sarcoma cell lines to ZOL. It will also help to understand and compare the relative involvement of the direct and indirect anti-tumoral effect of ZOL in the development of primary bone tumors such as Ewing's sarcoma. Our preliminary data published this year demonstrated the proof-of-concept for the therapeutic interest in using bisphosphonate such as zoledronic acid in Ewing's sarcoma. The proposed program will complete this work, especially for high risk patients (with bone and pulmonary metastases) and for those with tumors resistant to ZOL. The proposed scientific project includes fundamental and preclinical studies which will be undertaken in the research laboratory INSERM U957 directed by Pr Dominique Heymann, located in the faculty of medicine in Nantes (France). The impact of these studies will be to propose zoledronic acid as adjuvant therapy for Ewing's sarcoma patients in the next European protocol (following the current EuroEWING99) to help prevent recurrence and metastasis and to improve prognosis for patients with metastatic or unresponsive disease. The full title of this experimental plan for citation is, "Targeting Bone Microenvironment as a New Therapeutic Strategy in Ewing’s Sarcoma: Combination of Zoledronic Acid with Chemotherapy in Mouse Preclinical Models." 1. Ewing, J., Diffuse endothelioma of bone. Proc NY Pathol Soc, 1921. 21: p. 17-24. 2. Iwamoto, Y., Diagnosis and treatment of Ewing's sarcoma. Jpn J Clin Oncol, 2007. 37(2): p. 79-89. 3. Arvand, A. and C.T., Denny, Biology of EWS/ETS fusions in Ewing's family tumors. Oncogene, 2001. 20(40): p. 5747-54. 4. Turc-Carel, C., et al., [Chromosomal translocation (11; 22) in cell lines of Ewing's sarcoma]. C R Seances Acad Sci III, 1983. 296(23): p. 1101-3. 5. Delattre, O., et al., Gene fusion with an ETS DNA-binding domain caused by chromosome translocation in human tumours.Nature, 1992. 359(6391): p. 162-5. 6. Tirode, F., et al., Mesenchymal stem cell features of Ewing tumors. Cancer Cell, 2007. 11(5): p. 421-9. 7. Bhansali, S.K., and P.B., Desai, Ewing's Sarcoma : Oservations on 107 cases. J Bone Joint Surg Am., 1963. 45(3): p. 541-553. 8. Dahlin, D.C., Coventry, M.B., and P.W., Scanlon, Ewing's Sarcoma : A Critical Analysis of 165 Cases. J Bone Joint Surg Am., 1961. 43(2): p. 185-192. 9. Sutow, W.W., and M.P., Sullivan, Cyclophosphamide therapy in children with Ewing's sarcoma. Cancer Chemother Rep, 1962. 23: p. 55-60. 10. Hustu, H.O., et al., Treatment of Ewing's sarcoma with concurrent radiotherapy and chemotherapy. J Pediatr, 1968.73(2): p. 249-51. 11. Hustu, H.O., D. Pinkel, and C.B., Pratt, Treatment of clinically localized Ewing's sarcoma with radiotherapy and combination chemotherapy. Cancer, 1972. 30(6): p. 1522-7. 12. Rosen, G., et al., Curability of Ewing's sarcoma and considerations for future therapeutic trials. Cancer, 1978. 41(3): p. 888-99. 13. Paulussen, M., et al., Localized Ewing tumor of bone: final results of the cooperative Ewing's Sarcoma Study CESS 86. J Clin Oncol, 2001. 19(6): p. 1818-29. 14. Jurgens, H., et al., Multidisciplinary treatment of primary Ewing's sarcoma of bone. A 6-year experience of a European Cooperative Trial. Cancer, 1988. 61(1): p. 23-32. 15. Paulussen, M., et al., Results of the EICESS-92 Study: two randomized trials of Ewing's sarcoma treatment--cyclophosphamide compared with ifosfamide in standard-risk patients and assessment of benefit of etoposide added to standard treatment in high-risk patients. J Clin Oncol, 2008. 26(27): p. 4385-93. 16. Chirgwin, J.M. and T.A., Guise, Molecular mechanisms of tumor-bone interactions in osteolytic metastases. Crit Rev Eukaryot Gene Expr, 2000. 10(2): p. 159-78. 17. Lamoureux, F., et al., Therapeutic relevance of osteoprotegerin gene therapy in osteosarcoma: blockade of the vicious cycle between tumor cell proliferation and bone resorption. Cancer Res, 2007. 67(15): p. 7308-18. 18. Chikatsu, N., et al., Interactions between cancer and bone marrow cells induce osteoclast differentiation factor expression and osteoclast-like cell formation in vitro. Biochem Biophys Res Commun, 2000. 267(2): p. 632-7. 19. Guise, T.A., The vicious cycle of bone metastases. J Musculoskelet Neuronal Interact, 2002. 2(6): p. 570-2. 20. Guise, T.A. and J.M., Chirgwin, Transforming growth factor-beta in osteolytic breast cancer bone metastases. Clin Orthop Relat Res, 2003(415 Suppl): p. S32-8. 21. Paget, S., The distribution of secondary growths in cancer of the breast. 1889. Cancer Metastasis Rev, 1989. 8(2): p. 98-101. 22. Mancino, A.T., et al., Breast cancer increases osteoclastogenesis by secreting M-CSF and upregulating RANKL in stromal cells. J Surg Res, 2001. 100(1): p. 18-24. 23. Perez, M., et al., Melanoma cells stimulate osteoclastogenesis, c-Src expression and osteoblast cytokines. Eur J Cancer, 2001. 37(5): p. 629-40. 24. Thomas, R.J., et al., Breast cancer cells interact with osteoblasts to support osteoclast formation. Endocrinology, 1999.140(10): p. 4451-8. 25. Rogers, M.J., New insights into the molecular mechanisms of action of bisphosphonates. Curr Pharm Des, 2003. 9(32): p. 2643-58. 26. Body, J.J., Zoledronate. Cancer, 1997. 80(suppl 8): p. 1699-701. 27. Cheer ,S.M., and S., Noble, Zoledronic acid. Drugs, 2001. 61(6): p. 799-805. 28. Gatti ,D., and S., Adami, New bisphosphonates in the treatment of bone diseases. Drugs Aging, 1999. 15(4): p. 285-96. 29. Pataki, A., et al., Effects of short-term treatment with the bisphosphonate zoledronate and pamidronate on rat bone : a comparative histomorphometric study on the cancellous bone formed before, during, and after treatment. Anat Rec, 1997.249(4): p. 458-68. 30. Heymann, D., et al.,. Bisphosphonates : new therapeutic agents for the treatment of bone tumors. Trends Mol Med, 2004.10(7): p. 337-43. 31. Coleman, R.E., Risks and benefits of bisphosphonates. Br J Cancer, 2008. 98(11): p. 1736-40. 32. Tse, L.F., et al., Bisphosphonates reduce local recurrence in extremity giant cell tumor of bone: a case-control study.Bone, 2008. 42(1): p. 68-73. 33. Wunder, J.S., et al., Opportunities for improving the therapeutic ratio for patients with sarcoma. The Lancet Oncol, 2007.8(8): p. 513-24. 34. Lau, Y.S., et al., Cellular and humoral mechanisms of osteoclast formation in Ewing's sarcoma. Br J Cancer, 2007.96(11): p. 1716-22. 35. Inoue, R., et al., The inhibitory effect of alendronate, a nitrogen-containing bisphosphonate on the PI3K-Akt-NFkappaB pathway in osteosarcoma cells. Br J Pharmacol, 2005. 146(5): p. 633-41. 36. Kubista, B., et al., Anticancer effects of zoledronic acid against human osteosarcoma cells. J Orthop Res, 2006. 24(6): p. 1145-62. 37. Kubo, T., et al., Inhibitory effects of a new bisphosphonate, minodronate, on proliferation and invasion of a variety of malignant bone tumor cells. J Orthop Res, 2006. 24 (6): p. 1138-44. 38. Benassi, M.S., et al., Growth inhibition and sensitization to cisplatin by zoledronic acid in osteosarcoma cells. Cancer Lett, 2007. 250 (2): p. 194-205. 39. Murayama, T., et al., Efficacy of the third generation bisphosphonate risedronate alone and in combination with anticancer drugs against osteosarcoma cell lines. Anticancer Res, 2008. 28 (4B): p. 2147-54. 40. Heymann, D., et al., Enhanced tumor regression and tissue repair when zoledronic acid is combined with ifosfamide in rat osteosarcoma. Bone, 2005. 37(1): p. 74-86. 41. Labrinidis, A., et al., Zoledronic acid inhibits both the osteolytic and osteoblastic components of osteosarcoma lesions in a mouse model. Clin Cancer Res, 2009. 15(10): p. 3451-61. 42. Kubo, T., et al., Efficacy of a nitrogen-containing bisphosphonate, minodronate, in conjunction with a p38 mitogen activated protein kinase inhibitor or doxorubicin against malignant bone tumor cells. Cancer Chemother Pharmacol, 2008.62(1): p. 111-6. 43. Zhou, Z., et al., Zoledronic acid inhibits primary bone tumor growth in Ewing sarcoma. Cancer, 2005. 104 (8): p. 1713-20. 44. Ory, B., et al., Farnesyl diphosphate synthase is involved in the resistance to zoledronic acid of osteosarcoma cells. J Cell Mol Med, 2008. 12(3): p. 928-41. Vincristine-Ifosfamide-Doxorubicin-Etoposide; VAI: Vincristin-Adriamycine-Ifosfamide; VAC: Vincristin-Adriamycine-Cyclophosphamide; Bu-MEL: Bulphalan-Melphalan. Bone tumor cells (osteosarcoma and Ewing's sarcoma) produce soluble factors activating the osteoclasts, directly or indirectly via osteoblast stomal cells. When osteoclasts are activated, they degrade the bone matrix, allowing the release of growth factors trapped in this matrix, such as: TGF-b (Transforming Growth Factor-beta), FGFs (fibroblast growth factors), PDGFs (platelet derived growth factor), BMP (Bone Morphogenetic Protein), IGF-1 (Insulin-like Growth Factor)… In turn, these factors activate the proliferation of tumor cells. 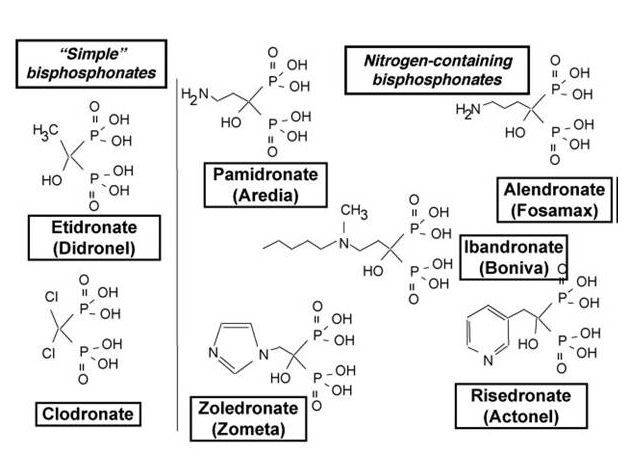 Simple BPs (non N-containing BPs): etidronate and clodronate, and N-containing BPs (pamidronate, alendronate, idandronate, risedronate and zoledronate). Schema of the two experimental approaches used to induce soft tissue (A) and bone tissue (B) models of Ewing's sarcoma which reproduce the clinical development of the human disease. A: Ewing's sarcoma cells were injected intra-muscularly at the contact of the tibia. The tumor develops close to the bone environment and then will invade the bone. B. In the second model, tumor cells were injected directly into the bone marrow cavity of the tibia, allowing a slow intra-osseous growth that gradually destroyed the cortical bone and then invaded the soft tissues. Mice were treated or not with ZOL (100 µg/kg, twice a week during 22 days). A. The mean tumor volume is represented throughout the protocol. B. The tibia micro-architecture is compared by micro-scanner analysis between naive mice (no tumor), mice which develop Ewing's sarcoma (CT) and mice treated with zoledronic acid (ZOL) as described above. SK-ES-1, A-673, RD-ES cell lines were considered sensitive, whereas STA-ET-1, TC-71, EW-24, SK-N-MC were considered less sensitive ("resistant"). Human A-673 ES cells were seeded and cultured for 24 hours in the presence of ZOL. Then 4.104 cells were placed on the top of the Boyden's chamber and left to invade the Matrigel 24h without ZOL. Microscopic observation (x10) of A-673 cells on the bottom of the Boyden's chamber at the end of the 24h incubation. MMP-2 and MMP-9 activities were evidenced at the corresponding molecular weight. A-673 and TC-71 human ES cell lines were cultured in the presence or absence of zoledronic acid at increasing concentrations (5 to 100 µM) for 24 hours. 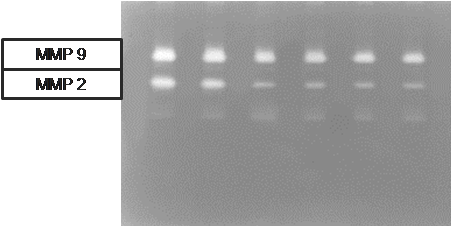 The supernatant was then harvested and submitted to electrophoresis in a gel containing gelatin. ES cells were revealed by positive CD99 immunostaining. A. Control mice treated with PBS (magnitude x10). B. Mice treated with Zoledronic acid (ZA) 100 µg/kg, twice a week during 4 weeks (magnitude x15). Both small (spontaneous) and big (experimental) metastases can be seen in control mice whereas only experimental ones are seen in ZA treated mice revealing that ZA inhibit spontaneous metastasis formation from established primary ES tumor. The Liddy Shriver Sarcoma Initiative funded this $90,000 grant in June 2011. The study was made possible by generous gifts from the Arlo and Susan Ellison Family, the Jack Langseder 4evRSTRONG Foundation and Strike Out Sarcoma (in memory of Michael Lio).